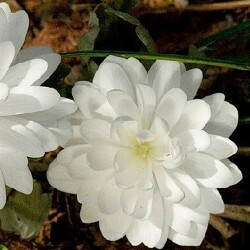 Sanguinaria There is 1 product. A little unusual gem. Plant early flowering wood slot underground rhizomes naturalizing slowly. Pretty deeply lobed leaf round (spent). The pristine white flower-shaped "little lily" appears draped in its rolled sheet. Well drained soil humus, fresh.